The state bird of Michigan since 1931, the American robin has been the harbinger of spring for many generations of people living in the state. The American robin is one of the few native American species to have benefited from human development. In Michigan, each new farm that emerged where forests once stood and each town with suburban neighborhoods, parks, gardens and orchards provided new habitat and breeding grounds for the birds. By the 1930s the American robin had become Michigan’s most widespread songbird. Part of popular culture with songs such as “Rockin’ Robin” and “When the “Red, Red Robin Comes Bob, Bob, Bobbin’ Along,” robins are often the first birds children can identify. Robins! is an environmental art installation at Michigan Legacy Art Park that draws attention to bird migration and the impact the American robin has had on our culture. 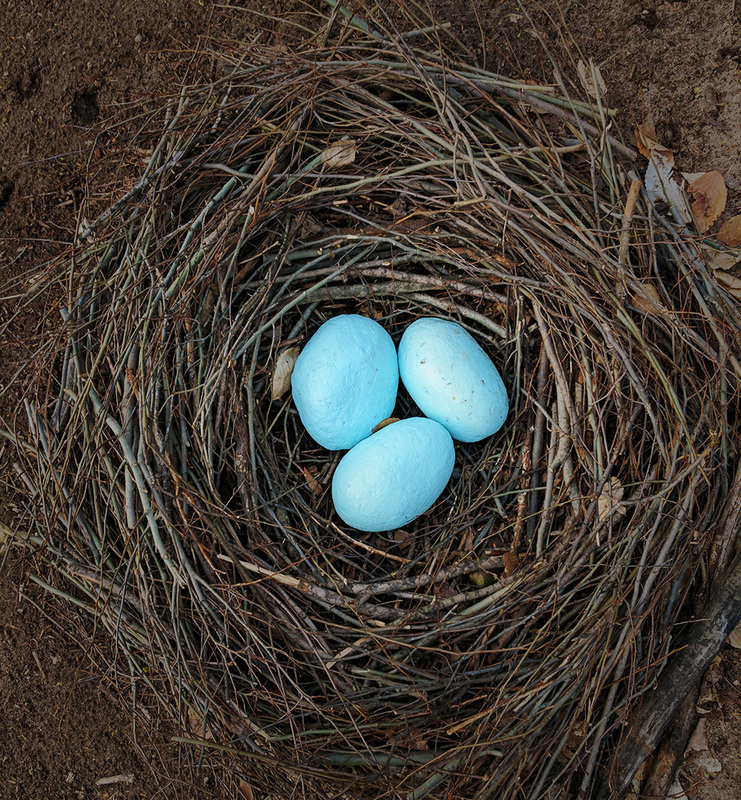 The installation consists of three earth-mound sculptures featuring robins and a bird’s nest containing three eggs. Formed to scale, the robins have a 14-foot wingspan, are nine feet in length and two feet in height. The mounds capture the birds in various stages of flight as they head slightly uphill toward the nest. Each are planted with shady grass seed, creating a habitat for live robins.